So my buddy Doug and I went for a ride Sat up I-90 looking for some fire roads to play on. We didn't find any without gates by the tome we got to North Bend, so we headed up the Middle Fork road behind Kens Truck Town. It follows the river Northeast for 10 miles or so with some strange new paved sections intermixed with potholed dirt road and ends at the trail head for the Taylor River hiking trail. 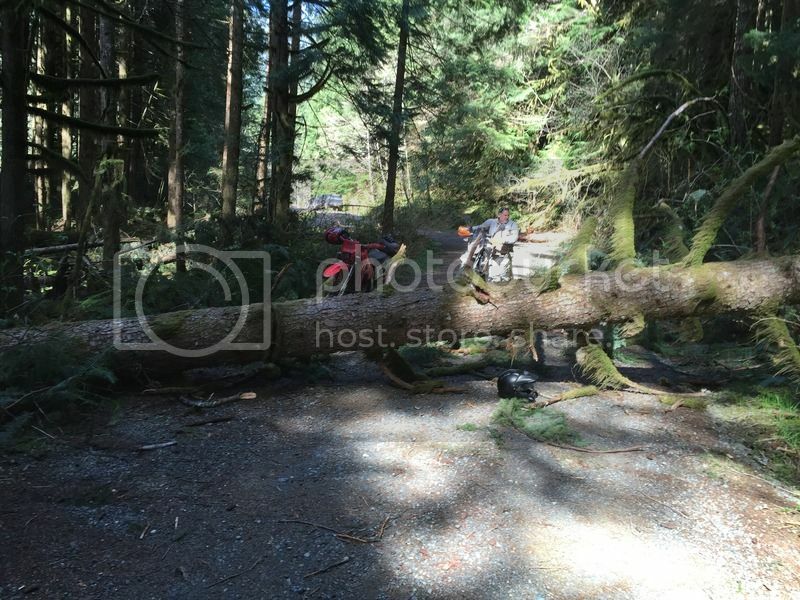 We got to the end, which had a couple washouts, so there were only 2 or 3 4x4 trucks and a DS bike parked there. We checked the trail map for a minute and started to head back. We didn't even get off the bikes, so maybe 2 minutes max. As we started back down, maybe 100 yards, we came up on this! For a second, I thought I had taken a wrong turn, but there were no other ways out? This rather large tree had fallen across the road while we were turning around! You can see the trucks parked behind us, no idea if they are still there? It was a pretty good size tree, about 2' in diameter. It was pretty dead, but there was no wind at all? 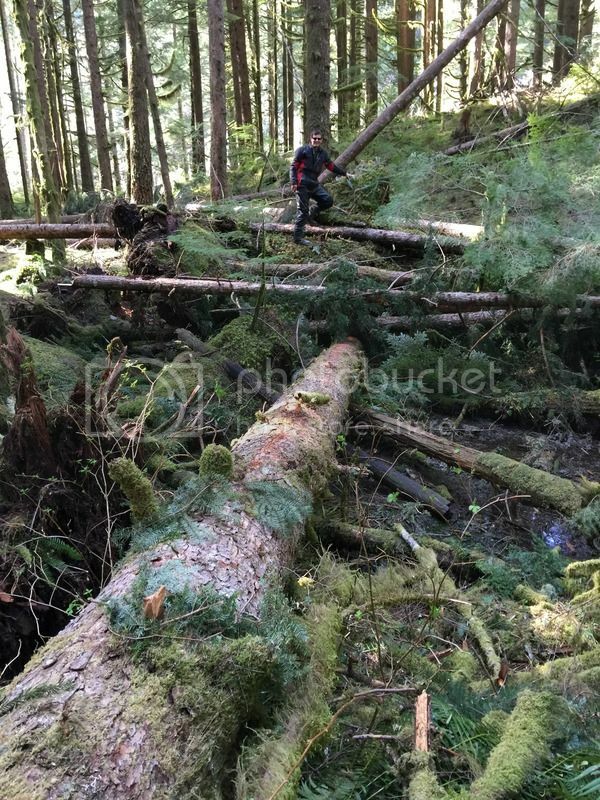 Here I am standing on the root ball, which was fairly large. We felt pretty lucky, but a guy came walking up who was in a truck we passed just before the end and he said the tree fell about 50ft in front of his truck as he was driving up the road!?! I told him to buy a lottery ticket. We dragged Doug's 690 and my XR650R under the end of the tree and headed home. It was a kind of weird end to a fairly mild ride! TREX600 and Basco2 like this. Wow! Hope someone in the truck had a chainsaw. Perhaps we have been asking the wrong question all along. Dang...you guys were lucky. Looking at that marshy ground and them pine trees not having much of a deep root structure, those trees might start to fall like dominoes once a few go. Wow, lucky timing on everyone's part. I've ridden that section of road many times, too bad so many other roads in that area have been gated over the past 5 or so years. pete, I'm bummed out that you didn't jump it. sunofnun, wooden and Basco2 like this. Are you sure it wasn't suppose to be an ambush from the local indians, angry you were up on their land? Maybe the guy in the truck felled the tree to try and keep you there for...uh...reasons. Maybe the other DS and truck were past..."guests" of his? Did you miss the sound of the tree falling over the noise of the banjos? Holy smoke... I'd say that's a bit too close for comfort! I seriously considered it, but the lowest part of the tree was to the far right and it was angled that way too, and the edge of the road dropped off rather steeply, making sliding off a bad thing. So I took the easy way out. I don't think we ever turned the bikes off and we were wearing helmets and ear plugs, so it might have made a bunch of noise, but I never heard anything? 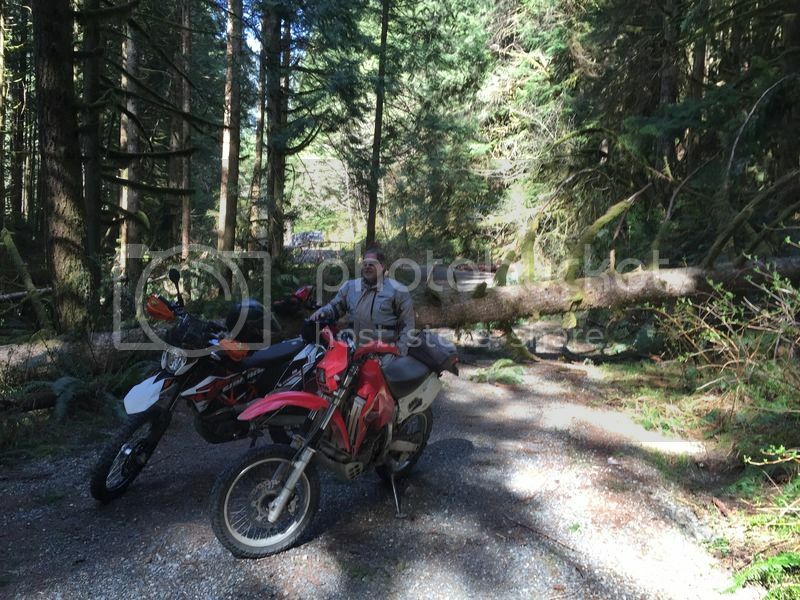 It might be a good idea to carry a Ronco Pocket Chainsaw on your adventure rides!